Tough, Dependable, Fast, Precise The multipurpose Ranger 3000 has all of the capabilities to produce precise results rapidly for a variety of applications. With nine application modes, Ranger 3000 is the ideal scale to meet many industrial weighing needs. Portable and equipped with a rechargeable battery, this scale is beneficial in every corner of the factory and is equipped with functions and features that elevate the Ranger 3000 to a class of its own. Largest and Brightest Display Makes Ranger 3000 Ideal for Use in All Environments ? Ranger 3000 has the largest backlit display in its class and is equipped with checkweighing LED?s which makes it functional in almost any lighting condition. The Most User Friendly Scale on the Market ? Easy setup leads into even easier use with the SmarText? menu, ensuring that your valuable time is not wasted and you?re working as efficiently as possible. Rapid Stabilization Provides Unmatched Throughput ? View your results in less than one second, and then see your efficiency, throughput and productivity soar! Largest Display in its Class - The big, bright display makes Ranger 3000 extremely easy to use. The 38.1mm (1.5?) 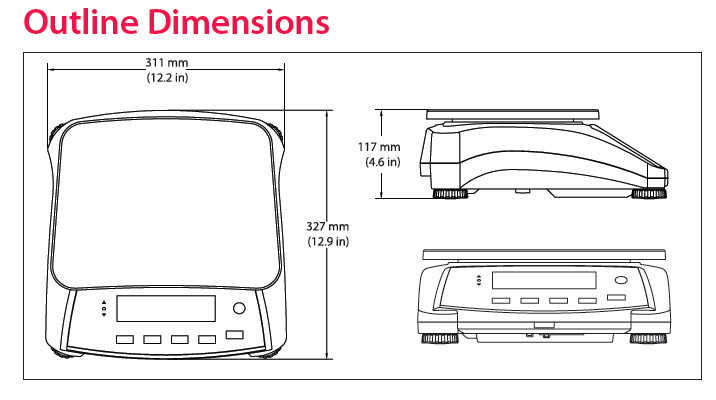 LCD display is 57% larger than displays on comparable products. Checkweighing LED?s clearly show when the weight on the platform is under, over, or within the target range. The bright display makes Ranger 3000 ideal for use in low-light visibility. Rapid Stabilization - Ranger 3000 produces accurate results within one second. Rapid stabilization virtually eliminates your wait time and allows you to move at a pace determined by you and not your weighing equipment. Work efficiently and with confidence that your results are accurate. Maximize your throughput without sacrificing accuracy with the Ranger 3000. The Most User Friendly Scale on the Market - SmarText? menu navigation and dedicated keys make Ranger 3000 the most user-friendly industrial scale on the market, complete with dedicated TARE key and Yes / No / Back / Exit menu functions. Ranger 3000 eliminates the need to master complex input commands and allows you to focus on the job at hand. Metrology - The Ranger 3000 series of scales meets or exceeds the Class III accuracy requirements in accordance with NIST Handbook 44 and Canada?s Weights and Measures Regulations. Standard Connectivity with Flexible Options - The Ranger?s included RS232 with optional Ethernet, second RS232 and USB offers additional data transfer capabilities or allows connection to multiple peripherals. Portability and Versatile Power Options - With its convenient integrated carrying handle and rechargeable lead acid battery that can provide power for more than 210 hours between recharges, the Ranger® 3000 can provide many hours of uninterrupted operation wherever you need it in your business. The Ranger includes an internal power transformer, so there are no outlet-hogging powerpacks, just a dedicated line cord. Weighing ? 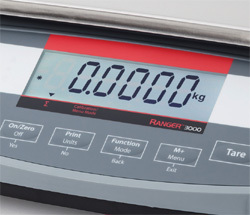 Determine the weight of items in one or more weighing units -- lb, oz, lb:oz, kg or g.
Percent Weighing ? With the weight on the platform easily shown as a % of a set reference weight, quickly measure and fill in packaging and formulating applications. Parts Counting ? Count parts fast for packaging and inventory control uses on the line or in the warehouse. Check Weighing/Percent/Counting ? Use the bright red/yellow/green LED?s to easily fill containers and packages by weight, by % or by a specified range of parts. Accumulation ? Keep a running total of all items, by weight, parts count or percent of reference. Great for tracking total throughput during each shift. Dynamic Weighing ? The Ranger averages the weight on the platform for a selected number of seconds, which is especially useful for weighing moving objects or in areas of excessive vibration. Display Hold ? Manually or automatically holds the last stable weight on the Ranger?s display. Allows large boxes to be weighed on the platform when the display is blocked from view. Can be used to help support accurate recordkeeping during processing. Statistics Printer Ready! - Combine the Ranger 3000 with the new OHAUS SF40A statistics printer and keep track of information critical for SQC processes.